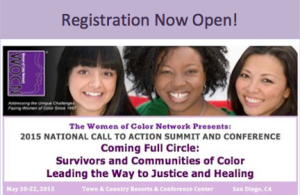 In this podcast, Zoe Flowers of the Women of Color Network and Jane Ralph of the Clarina Howard Nichols Center talk about the upcoming Women of Color Network’s Call to Action Summit and Conference that will take place May 20-22, 2015 in San Diego, California. The Summit and conference theme is “Coming Full Circle: Survivors and Communities of Color Leading the Way to Justice and Healing.” This event will explore the root causes of domestic and sexual violence, and examine how to support women of color leadership and aim for collective liberation in challenging racism, classism, sexism, homophobia, heterosexism, transphobia, ableism, xenophobia, ageism and other forms of oppression and bias. Registration is now open for the conference, the Women of Color Summit and Aspitrng Allies Summit.